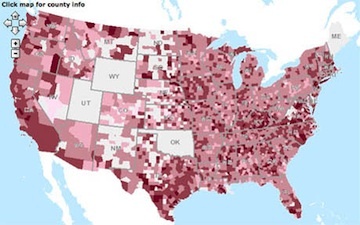 Business Detailed: As part of Michelle Obama’s anti-childhood-obesity campaign, Let’s Move!, the United States Department of Agriculture (USDA) launched an exciting new tool: the Food Environment Atlas. Developed by the USDA’s Economic Research Service in partnership with the Centers for Disease Control, the National Cancer Institute, the National Farm-to-School Network, and the University of Illinois at Chicago, the atlas allows anyone with an internet connection to create custom maps of their food environment. What’s more, it even makes the data sets embedded in the atlas available for download. The Atlas currently maps ninety food environment indicators, divided into three broad categories. “Food Choices” includes both measurements of food access and consumption, from the number of supermarkets per 1000 people to restaurant expenditures per capita. “Health and Well-Being” tracks dietary outcomes, such as hunger, diabetes, and obesity. “Community Characteristics” adds an extra level of demographic data, including income levels and metro/non-metro status. The idea, then, is that researchers, policy-makers, and individuals can compare counties across America, comparing and analysing the correlation between food choice, health outcomes, and population characteristics.